Just RT this tweet to enter. - Open to UK residents aged 18 or over. 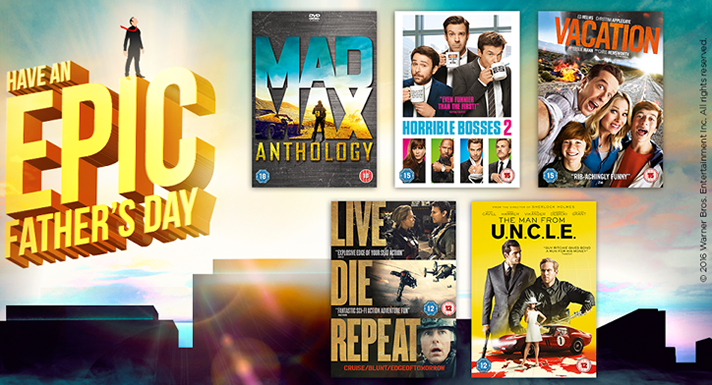 - There is one prize of 1x Mad Max Anthology, 1x Horrible Bosses 2, 1x Vacation, 1x Edge of Tomorrow and 1x The Man From U.N.C.L.E DVD. - One winner will be chosen randomly from all the RTs and announced on Twitter within 2 days of competition ending. - Winner must respond within 7 days and the prize will be delivered within 28 days of confirmation of delivery address. - The winners details will be passed to the promoter, but will not be passed onto any third parties. - The prize will be sent directly to the winner from Fetch Publicity. – There is no cash alternative to the prize stated and the prize is not transferable. - Delivery is not in the hands of DB Reviews and any damage to the prizes is not DB Reviews' responsibility.